Human gut microbiome composition is shaped by multiple factors but the relative contribution of host genetics remains elusive. Here we examine genotype and microbiome data from 1,046 healthy individuals with several distinct ancestral origins who share a relatively common environment, and demonstrate that the gut microbiome is not significantly associated with genetic ancestry, and that host genetics have a minor role in determining microbiome composition. We show that, by contrast, there are significant similarities in the compositions of the microbiomes of genetically unrelated individuals who share a household, and that over 20% of the inter-person microbiome variability is associated with factors related to diet, drugs and anthropometric measurements. We further demonstrate that microbiome data significantly improve the prediction accuracy for many human traits, such as glucose and obesity measures, compared to models that use only host genetic and environmental data. These results suggest that microbiome alterations aimed at improving clinical outcomes may be carried out across diverse genetic backgrounds. Rothschild D, Weissbrod O, Barkan E, Kurilshikov A, Korem T, Zeevi D, Costea PI, Godneva A, Kalka IN, Bar N, Shilo S, Lador D, Vila AV, Zmora N, Pevsner-Fischer M, Israeli D, Kosower N, Malka G, Wolf BC, Avnit-Sagi T, Lotan-Pompan M, Weinberger A, Halpern Z, Carmi S, Fu J, Wijmenga C, Zhernakova A, Elinav E, Segal E. Nature. 2018 Mar 8;555(7695):210-215. doi: 10.1038/nature25973. 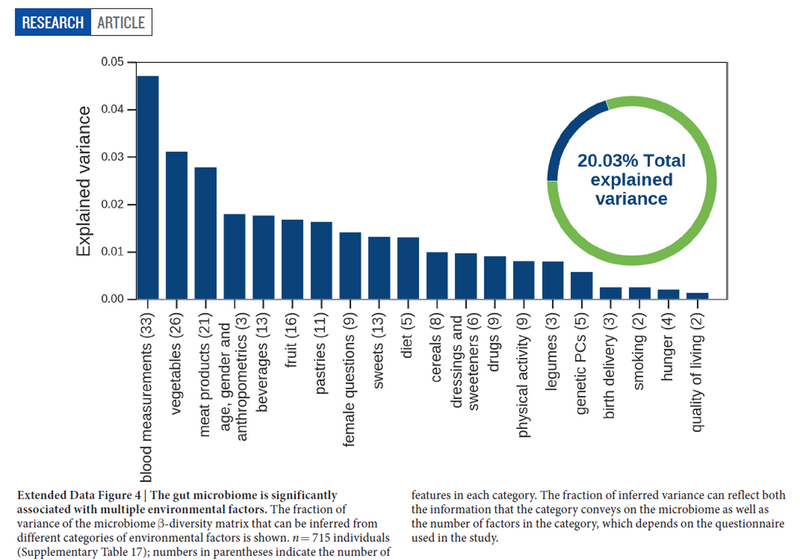 Keywords: human gut, microbiota, environment, host genetics, human gut microbiota, environment and microbiota, regulation of human gut microbiota, host genetics and microbiota, human gut microbiota composition, diet, health, environment dominates over host genetics in shaping human gut microbiota.